Charter boat fishermen connect with commercial fishermen to advance scientific understanding of fish movements. The bull shark named “Social Distortion” was originally tagged and released by angler Tyler Guidice on April 15, 2015 while fishing with Captain Chad Robert and Mate Hunter Lafever aboard the charter boat Outcast out of Haulover Inlet in southeast Florida. The bull shark was at liberty for 128 days until its recapture on August 21, 2015 by Captain Jack Rice while fishing aboard his boat F/V Barker. Captain Rice, a prominent commercial king mackerel fisherman in the area, recaptured the shark approximately 3 miles off the coast of Hobe Sound, then released it in excellent physical condition. The recapture location is 81 miles north of where the tag was originally deployed. The movement suggested by this tag recovery runs counter to the common assumption by the majority of local fishermen, who believe that bull sharks move north to south against the prevailing northern water current. 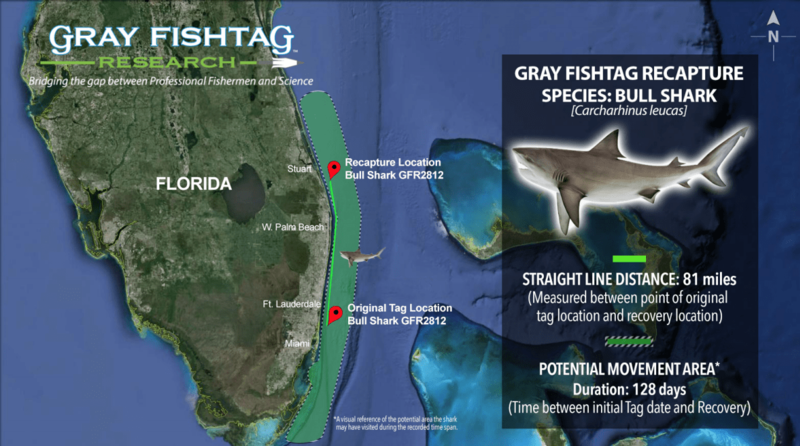 We plan to continue adding to the scientific discussion of bull shark movements through more tags and more tag recaptures. “As a commercial fisherman who makes a living from the water, I always report recovered fish tags because I understand the value of fish tagging programs like Gray FishTag Research. I am more than happy to help out,” Captain Jack Rice said. Captain Jack will receive a complementary pair of Costa Del Mar 580 sunglasses and a Gray FishTag Research Program Performance fishing shirt in appreciation for his efforts in supporting the tagging research. Commercial fishermen Captain Jack Rice will receive a complementary pair of Costa Del Mar sunglasses, a Tag & Recovery certificate, and Gray FishTag Research Program gear for reporting the tag recovery. The Outcast charter boat crew will also receive Gray FishTag Research Program gear for their tagging efforts. The Gray FishTag Research Program has been able to shatter the expectations for fish recapture rates thanks to the hard-working professional fishermen on the water day in and day out. Tags are provided free-of-charge to collaborating professional fishermen, and the tag data are available to the public at www.GrayFishTagResearch.org. These tagging and research efforts are made possible by our research centers and sponsors: AFTCO, AA Video, American Fishing Wire, FECOP, Blackfin Rods, Mold Craft, Costa Del Mar, CR Primo Fishing Tackle, Shadow Graphics, Crocodile Bay Resort, Grande Alaska Lodge, Marina Pez Vela, Los Sueños, Resort & Marina, and Zancudo Lodge.